We taken an iconic LEGO look and satisfied two unmet needs. Both Mom and child need a place to store their Bricks when they're not building and creating . Now they can do it with style! Even better we've made building easier. In order to help those committed builders we've worked out a solution to sort the bricks by size. Now after you add your Bricks to the opening on the top and you vigorously shake the Sorter back and forth your Bricks will sift into three different sizes. Most importantly the smallest bricks the hardest to find will all be found at the bottom for those all important details on your new creation. 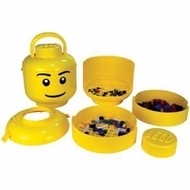 A fast way to sort and store your LEGO Bricks Lift each section to reveal sorted LEGO Bricks inside Built in carry handle Can hold over a thousand LEGO pieces!